All the flavors you love from buffalo wings without all the added fat. 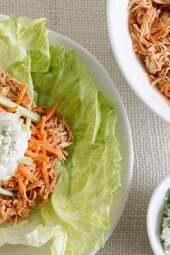 A delicious, low-carb lettuce wrap topped with shredded carrots, celery and blue cheese dressing. I topped it with skinny blue cheese dressing (not included in n.i.) or you can top it with my skinny ranch. If you’re a buffalo chicken fan, you may also like Buffalo Chicken Meatballs, Skinny Buffalo Chicken Dip or Skinny Baked Buffalo Wings. 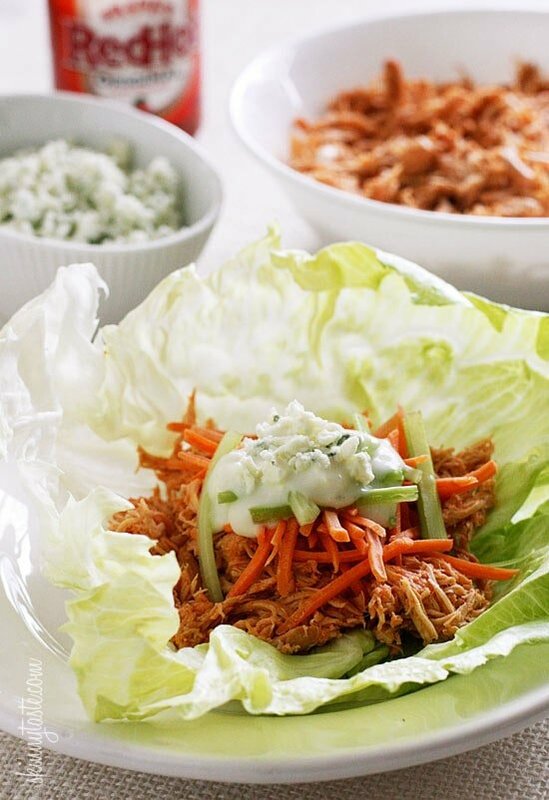 Making shredded buffalo chicken in the slow cooker is super easy, anyone can do this and you can use the chicken for everything from wraps and salads, to pizza toppings, sandwiches and more! I’ve now updated this with instructions for the Instant Pot as well! All the flavors you love from buffalo wings without all the added fat. 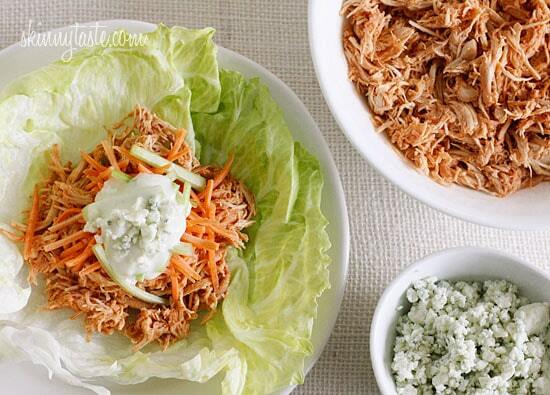 Making shredded buffalo chicken in the slow cooker or Instant Pot is super easy! This recipe was ok. Definitely don’t throw out the extra broth mixture… I saved it and used it for a soup! What’s the nutrition facts of just the finished chicken? If I want to do this on low for 8 hours, will I have the same result? Hoping to let it go all day tomorrow when I’m at work instead of the 4 hours on high. Thanks! Love this! Used the instant pot method and it was delicious! So easy too ???? Hi Gina. We love this buffalo chicken. We have a potluck to attend next weekend and I’m wondering if I can double the recipe? Is the cooking time still the same? Thanks! Sure! Cooking time is the same. What suggestions for condiments on this do you have for low calorie? Every time I make this recipe its a hit. I try doubling and tripling this recipe for extras but the kids seem to make it disappear faster than I can save it! Is this really 24oz of chicken? With only 16 oz of broth? Or is it (2) 4oz breast’s? Thanks! Will the chicken freeze well after cooking? Thinking of freezing in lunch sized portions for a quick meal when I’m in a pinch. This is a delicious and easy recipe. Really hits the spot when you’re craving the flavors of Buffalo wings! Ugh, didn’t read although the way through 🙁 added hot sauce in the beginning … we’ll see how it turns out!! I LOVE this recipe. I make only the chicken part, and I double it then freeze it in one-cup portions. It’s great to have on hand because it’s a great base for so many recipes. Although it’s already super easy to make, I’m super lazy, so I made it even EASIER! I shred the chicken in my Kitchenaid mixer: Place the cooked chicken in the mixer while it’s still warm. Using the paddle attachment, set speed to level 2, and let the mixer run for about 30 seconds to 1 minute. Keep an eye on it – you don’t want to let it go too long, or it’ll be mushed instead of shredded.. I understand that you can do this with a hand-held mixer as well, but I haven’t tried that yet. I just made this with frozen chicken breasts (I never remember to defrost anything – story of my life!) and it was delicious! I cooked it for the exact same amount of time (15 mins in the Instant Pot) and the chicken came out fully cooked yet still tender and moist. I am currently doing Whole30 for the month of January and I have a feeling this will be a stable meal for me! Hands down one of my favourite meals, I love chicken wings and this is a great replacement! 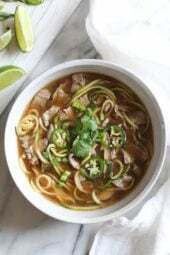 I usually add a couple slices of avocado and some green onions, so so good! Gina, where do the points come from? Aren’t all the ingredients 0 points now? Good point, this one somehow got missed! Yay! Another zero point meal! I added the hot sauce with the chicken broth mixture right away, will that be ok or over powering?? The link to the skinny buffalo chicken dip goes to the recipe for wings.l I can just search for it, right? I made these tonight. They were amazing! This can be Whole30, right? Just leave out the Blue Cheese? How long do leftovers last in the fridge if its just the chicken? We just ate this for dinner and it was delicious. I used an entire onion and fresh parsley. Stirring in a little fat free Greek yogurt at the end made it creamy. Thanks for the recipe! What size crockpot do you use for this? I have what I think is a 7qt crockpot and have been looking at getting a 2.5 or 3qt crockpot for smaller, 2 person meals, but I want to make sure that 2-3qts wouldn’t be too small for this recipe. I have a 6 qt. Any suggestions on a way to make this less spicy for kids? I love it the way it is, but got some “too hot” complaints from the peanut gallery. I used Texas Pete. Hi – I know you posted this a year ago, but my sister lives in NY near Buffalo so they eat wings a lot. Her kids also complain that they’re too spicy so they always order the sauce on the side so the kids can dip and get as much/little sauce as they want. You could reserved out some of the chicken plain for them to make wraps and then give them a cup of sauce on the side for dipping if they want? I made this so that I could have easy, pre-made lunches this week. It really is super easy and so good! I also made the skinny blue cheese dressing to go with and it was delicious. Thank you! What would you recommend as side dish if I’m making this for dinner? Made his recipe yesterday and followed the directs to a T. My chicken is crazy dry 🙁 Should I reduce time in the crock pot next time? I usually reserve some of the broth I used in cooking if it’s dry, otherwise you could use chicken thighs which are much juicier. This recipe looks great! I’m planning to try making this in the Instant Pot. Would it work if I put the hot sauce in from the beginning when cooking it in the Instant Pot? I’m planning to make it tonight for lunches this week. I’ll update on how it turns out in the Instant Pot! So I made this in the Instant Pot with the onions, celery stalk, and half a cup each of chicken stock and Frank’s Hot Sauce (I just put it all in there and pressed the poultry button).. It turned out great!! Sooo flavorful. It’s going to be amazing tomorrow for lunch as a lettuce wrap for me and a whole wheat wrap for my boyfriend. Thank you for another great recipe!!! Thanks for adding in your Instant Pot experience, Ava… I was hoping someone would mention it in the comments. Did you just put it on the Poultry setting? 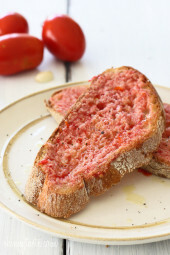 How would make this in instant pot? I’m cooking this for dinner tonight. Sounds yummy but is the calorie count for all six servings together? I’m wanting to lose weight and that seems a bit extreme. What is the individual calorie count? There are 6 serving size 1/2 cup chicken + veggies, calories 147.7 per serving. This has become a weekly favorite of ours. Now I double the recipe and share it with loved ones! Because I remove all of the fat prior to slow cooking it, we can eat this chicken COLD. 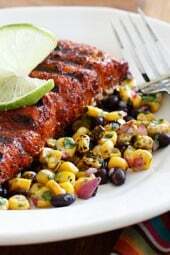 It’s absolutely wonderful served with your Zesty Avocado-Cilantro Buttermilk dressing. Please know how much I APPRECIATE your recipes. It’s especially helpful to me because all of your nutritional information is listed. Since my husband was recently diagnosed with Type 2 diabetes, we’ve been watching our carb intake and struggling with food that isn’t very flavorful. Since we found your website and Facebook page, we ENJOY eating once again. THANK YOU, THANK YOU, THANK YOU. You are welcome! Glad I can be of help! Great idea with the Zesty dressing! I don’t like ranch or bleu cheese, so can’t wait to try this with the Zesty dressing I already love! What type of hot sauce did you use? I keep reading and reading, and can’t seem to find that? What am I missing? I just have texas pete’s hot sauce… would that work alright in the recipe??? I wanted to start this tonight… but dont want to run all the way to the grocery store again…. Great recipe! Any leftover buffalo chicken is also great for making delicious quesadillas! Looks delicious! Wanting to make this for a party next Saturday. Think I could slow cook the chicken the day before, then shred and reheat with the sauce on party day?? Hi! I’m cooking about 3 lbs tomorrow. How long & what setting do you recommend for the crock pot ? What else needs to be adjusted? Really, really yummy! Easy to make too!!! Thanks for this recipe! My husband is a big buffalo wing fan but had lap band surgery so he can’t have them anymore. I had this with the low fat bleu cheese dressing (which was delicious). After the four hour cook time on high, I shredded it, added the hot sauce (did 1/2 cup more since we live the flavor) and after the additional 30 minutes, the chicken mixture was a little wet which made for very messy wraps. Did I skip a step or do something wrong? You could drain the chicken before shredding, then add the hot sauce. Maybe I’ll make sure the chicken is really dry before I shred it. Is the 1/2 cup reserved broth necessary if I’m doubling the hot sauce? That might have contributed. Thanks again for responding so quickly! Since you’re adding more hot sauce which is liquid, you don’t need to reserve the broth. Keep in mind hot sauce is high in sodium. Yummy!!! Thanks for the recipe. Made these as is, and they are amazing! I did not have a problem with the moisture level as some others did. This is my new go to for lunches!!! If I planned to do this while I am at work, can I cook the chicken on low for 8 hours instead of high for 4? Or will the chicken come out too soggy? Thanks! Low 6 hours would work, then leave it on warm. I am ordering a crock pot and was wondering if it's ok to use a 3 quart crock pot or if I should be using a bigger one for this recipe, thanks! Can this be cooked on low? If so how many hours would I cook it for? Thanks!